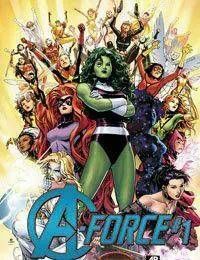 Marvels Mightiest Women finally get their own explosive series! In a secluded corner of the Battleworld, an island nation is fiercely protected by a team of Avengers the likes of which has only ever been glimpsed before. Fighting to protect the small sliver of their world thats left, the Amazing A-FORCE stands shoulder-to-shoulder, ready to take on the horde!